▪ Trading stock index futures will soon be less risky. While there are a plethora of advantages to trading futures contracts relative to stock market ETFs such as favorable tax treatment, easier tax reporting, around the clock market access, ease of shorting the market, and trading on margin without the burden of paying interest charges to a brokerage house. There is one large bright pink elephant in the room; leverage and the associated risk (large swings in position profit and loss). Although leverage could also be argued as an advantage to trading futures, we are only human and, therefore, tend to indulge when we shouldn’t. Just as most Las Vegas buffet patrons make a point to eat themselves to a state of bloat and discomfort because there is no incremental cost to doing so, futures traders often lean toward glutinous use of free leverage. Eventually, this misuse of leverage and lack of risk management can lead to the ruin of a trading account. Accordingly, futures trading has traditionally been considered off-limits for the average risk-averse investor. However, as the futures exchanges add smaller contracts that conventional wisdom will be challenged. The Chicago Mercantile Exchange Group (CME) has recognized the need for a stepping stone for those interested in the convenience of futures trading but not interested in the big risks that come with it. Accordingly, on May 6th of 2019, the CME will be launching a suite of micro-sized futures contracts written with the major US stock indices as the underlying assets. Specifically, there will be a Micro E-mini futures contract for the S&P 500, the NASDAQ-100, the Dow, and the Russell 2000. Each of these bite-sized contracts will be 1/10th the size of the traditional E-mini versions. This means instead of a trader making or losing $50 per point in the S&P or $20 per point in the NASDAQ, they will make or lose a more manageable $5 or $2 respectively. If you are wondering what the contract size is and the margin is, you are asking the right questions. As with any index future, the contract size is dependent on the index price. The value can be determined by multiplying the point value by the current price. Thus, if the S&P 500 is trading at 2,850 the Micro E-mini futures contract would represent $14,250 worth of an S&P 500 allocated portfolio of stocks. The margin required to trade these products is estimated to be about $660 for the E-micro S&P 500 and $836 for the E-micro NASDAQ-100 futures contract. The low margin rates make stock index futures trading more accessible to retail traders and the smaller contract size enables traders with low-risk tolerance to more comfortably participate. Nevertheless, even trading Micro E-mini futures requires participates to educate themselves on the risk involved. On a percentage basis, the new Micro E-mini futures offer just as much leverage as their full-sized counterparts. Thus, traders must understand and, in my opinion, work to mitigate that leverage through overfunding. To illustrate, if the S&P 500 is trading at 2,800 a trader buying or selling that futures contract is making or losing money based on $14,000 worth of S&P allocated stock. If that trader purchases a single Micro E-mini S&P 500 futures contract in an account with a $1,000 balance, he is utilizing a significant amount of leverage (trading an asset worth 14 times the value of the trading account). As we all know, leverage is a double-edged sword that can be fatal if caught on the wrong side. The same trader can reduce leverage by allocating more funds to the account per contract traded. For instance, purchasing a single contract in an account funded with $7,000 leaves the trader exposed to risk on an asset worth twice the account balance. This leverage ratio of 2 to 1 is much easier to manage than 14 to 1, but it is still leverage that some are uncomfortable with. However, funding the account with $14,000 eliminates the leverage involved. Thus, the trader can access the benefits of the futures markets (23-hour trading, lower taxes, and simpler reporting, the ability to go short without borrowing shares or paying interest, etc.) without being exposed to the scary side of futures trading; leverage. The greatest aspect of being in control of leverage usage is the ability to scale in and out of trades utilizing various levels of aggression and leveraged as your opinions change. For instance, a trader bearish the S&P 500 could start by selling a single Micro E-mini S&P futures contract at 2800 with a margin requirement of about $660 and a notional value of $14,000. Should the price of the S&P move higher to 2820, the trader could then opt to add another contract to the position resulting in a net short position with an average price of 2810, a margin requirement of $1,320 and a notional value of about $28,100. This could go on every 20 points until the trader was short a total of 10 Micro futures contracts from an average price of 2890 (notional value of $144,500 with a margin requirement of $6,600) and the last contract being sold at 2980. This is an extreme example of a long-term scale trade, but it illustrates an important point; the ability to scale in will almost always result in a better average entry (and exit) price. Had a one lot regular-sized E-mini S&P trader turned bearish at 2800 and held through a rally to 2980, the trader would be in the hole by $9,000 requiring a 180-point decline to reach the breakeven point. 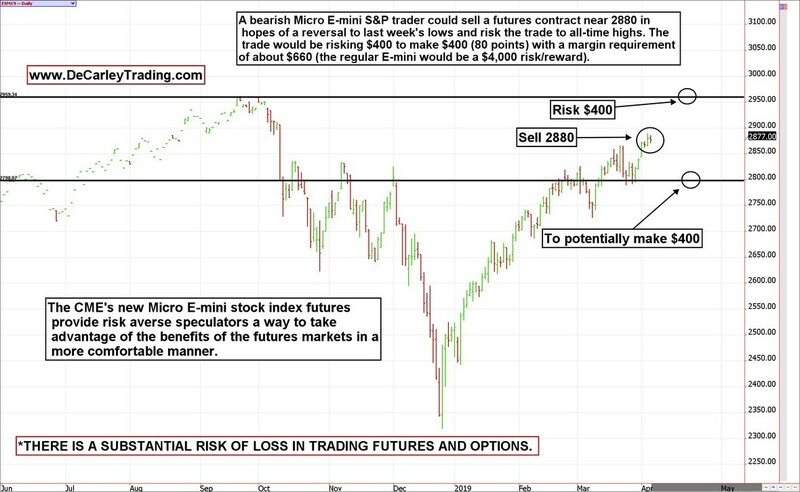 The Micro E-mini trader, on the other hand, would be sustaining a loss of $4,500 but only requiring a move to 2890 (100 points) to achieve break-even on the trade. Obviously, a bearish trader of any type or trading size wouldn’t want to be short the S&P 500 for an entire 180 points, but again this example illustrates the vast advantage of incrementally employing smaller contracts relative to simply being “all in” or “all out” with a larger sized contract. The scale trader was able to apply the advantage of the principles of dollar cost averaging to a short position in the futures market utilizing leverage (if desired). Keep in mind, scale trades can be more, or less, aggressive. For instance, an aggressive trader might add contracts every 10 points of adverse movement rather than every 20 points and a more conservative trader might add contracts ever 100 points. In this example, a trader selling a single lot at 2800 would be sustaining a loss of $1,000 if the market moved 200 points higher to 3000; at which time he could sell another contract to raise the breakeven price to 2900. Again, selling a futures contract and sustaining a 200 point loss isn’t an ideal strategy, but it puts things into perspective. The Micro E-mini gives traders quite a bit of lasting power and room for error and also removes some of the emotional hardships that come with making or losing $50 per point in the S&P 500. In conclusion, trading futures is no longer reserved for those with either large trading accounts, high tolerance to risk, or both. The futures markets are what you make it. Those seeking high amounts of leverage will find what they are looking for. Now thanks to the CME’s new Micro stock index futures, those looking for efficient around the clock trading with mitigated risk exposure and the ability to dial leverage down to zero, will also find what they are looking for in the futures markets.